I realize that I like going to see movies. That used to be an occasional, almost rare thing for me, but now that I'm just a few minutes away from a theatre, I find that it tempts me. When I went to buy a much-needed new hairdryer, for instance, I thought I'd pop in to Harkins first. The Imaginarium of Doctor Parnassus looked kind of interesting; I might have saved it for a movie to rent, but it seemed like it had visuals that would be better on the big screen. Definitely had the visuals, which were Alice-in-Wonderland-trippy at times and obviously green-screened, but still a bit of a feast for the eyes. That was all I was expecting to get, but the plot was good, as well. It plays with the Faust idea of bartering with the devil, only Doctor Parnassus is bartering with his daughter instead of his own soul. That sounds just as much like Rumplestiltskin, which happens to be one of my favorite fairy tales, to me. This movie hooks your interest all throughout; definitely one to watch. The ending was too anti-climactic, though. Instead of drawing to a close, it dwindled down. There was something missing, one extra step that should have been taken. All the same, this will probably be a movie I buy. Classes started again on Tuesday, ending my lovely, long break. They do promise to be interesting, even if I shall have many, many books to read this semester, but I decided I should have a treat Tuesday afternoon. A pre-semester award, if you will. I went to see Peter Jackson's The Lovely Bones. As you will recall, I first read the book because I thought I might like to see the movie. The trailer looked good, if action heavy. And during the first part of the movie, I was impressed. Another visual movie, with stunning CG crisper than most of Parnassus and excellent cinematography. But after the halfway point, I was waiting for certain things from the book to happen. They didn't. The movie ended. I didn't expect the man who made all the intensely long Lord of the Rings movies to have cut too much out of this one. Maybe because he was trying not to get the same King Kong criticism? Too long, cut all of such and such out? Now, in the book, the Salmon family really goes down to the depths. They went down in the movie, but they weren't far enough. Abigail's affair with Len Fenerman isn't exactly something I fancy, but it was an important part of the book. At least a hint should've been in the movie. In the book, though the family knows the truth, Susie's case is never solved. It essentially is in the movie. I think that fact, however subtle, is close to fatal. I was surprised when I read the book to find that the peace at the end didn't come from the solving of the case, but from acceptance and love. I didn't get those same vibes from the ending of the movie. Just a couple of tweaks and I think it could have been so much a better adaptation. All the same, I do think it was well-done . . . the things it does achieve aren't easily reached . . . it just wasn't my absolute favorite book to begin with. My new band (for listening, not playing in) reminds me of Blondfire, just a little older and a little more fey. They have some intriguing music, so check out Metric at their site. Heard of The Hillywood Show? No? Then you must watch them (two sisters, Hilly and Hannah, who do this all non-profit). They parody like no one else, using amazing imitation, fan film experimentation, and parodying that laughs with movies rather than against. Their greatly-awaited New Moon Parody came out earlier this month and already has 811, 281 views. It's unlike any parody I've seen before; they take the opposite approach most New Moon parodies do, focusing on Bella's rebellion instead of her depression. Hillywood, besides being meticulous about detail, also is into layers. You'll notice a new edge each time you watch a parody or episode. Take a look at their website here. Fireflight's new album, For Those Who Wait, comes out next month. You should really go pre-order it . . . .
And it is very cold today. Methinks I shall go make some hot chocolate now. Having some time extra about a month ago, I spent an hour browsing Barnes & Noble. Just the fiction section. I have plenty of books at home that I haven't gotten to reading yet; I was hence only planning on buying a book that stood apart. Author to three short, tiny, plain-covered books was Laura Wiess. The microscopic size intrigued me, as did the few words I skimmed in one or two of the books. The style seemed unique, so when I finally left the store, Leftovers came with me. As you must be gathering, I was in the mood for something different. Vastly different, on an opposite scope, yet still something I could enjoy for whatever reason. Nothing predictable. Amazingly, this book was the perfect choice for my mood. Told from the perspective of two teenage girls whose home lives are more than trying, it switches between third person and second. I'd have to check, but I think there is more second person than third. I never would have thought that would work so well; it doesn't make the narrative drag, only working to further the girls' perspective. The book's material can be a little depressing and isn't the sort of thing I seek out to read, yet the style is unique, as I had guessed. Refreshing even while depressing. 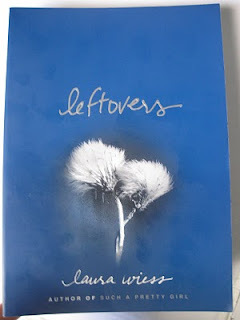 Enough that I'd like to try out Laura Wiess's other books. Then we have the audio drama for CS Lewis's The Screwtape Letters, starring Andy Serkis (aka Gollum) as Screwtape. nephew make effective ways of drawing the audience into the audio as a story. I only wish the CD's weren't so pricey. dramas go, but as far as I wanted to pay, yes. 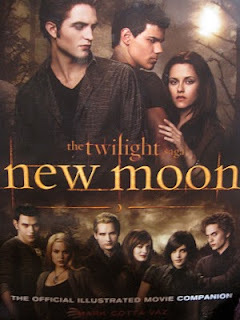 And no, I'm not quite sick of Twilight and New Moon yet. A word on the latter's movie companion: I thought it was much better than the former's. The Twilight companion, for me, lacked the personal element I go to companion's for. I want to know what it was like for the cast and crew on set. The New Moon companion gives an abundance of quotes that satisfied my wants. Movie companions also describe some of the technology used; they can't go into too much detail lest readers get confused by technical descriptions, but after you read a couple of books, the brief info starts to repeat. Not so with this book. Sure, some processes I knew about, but I also learned a couple of things about moviemaking in general. I feel more satisfied with Mark Cotta Vaz's work as a companion writer now. That's it, I believe. Until next time.